An elegant, pared-down stealth game with echoes of the original Deus Ex, driven by a compelling story of paranoia and betrayal. What is it? 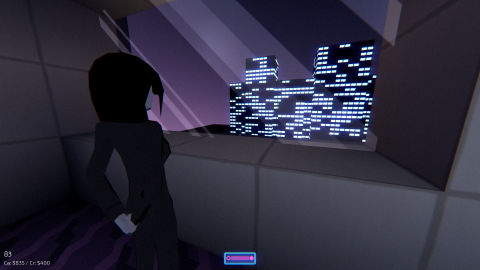 A first-person cyberpunk stealth game. The footsteps are drawing closer, but the hack is almost done. The layers of security are being stripped away, slowly. I’m almost in. Then, just as I break into the system, I hear the door squeak as the guard enters the room. In one rapid flurry of movement I grab the data, sprint away from the door, knee-slide into a corner of the room, and flick a nearby desk lamp off, cloaking myself in shadow. The guard wanders in, looks around, then leaves. I got away with it. I’m the coolest cyberpunk ever. Neon Struct’s slide is one of my favourite things about it. Hit C while sprinting to transition seamlessly into it, and it’s completely silent, meaning guards can’t hear you do it. It feels amazing, and has saved my life more times than I can count. It’s just one of the many tricks hidden up super-spy Jillian Cleary’s sleeve. She’s the hero of this cyberpunk stealth game: an agent framed for treason and on the run from her former paymasters. In this vision of a future America, government surveillance has become invasive to the point where citizens are being secretly implanted with tracking devices. It’s your mission to expose this sinister programme, clear your name, and smash the system. It’s no coincidence that our hero’s initials are JC, or that the first door code in the game is 0451. Neon Struct owes a lot to Deus Ex, from its systems-driven stealth, gadgets, hacking, and multi-path level design to its grim dystopian setting and conspiracy-laden plot. As I crawl through vents, hack security cameras, and knock guards unconscious, I can’t help but reminisce about Liberty Island. Unlike Denton, however, Cleary can’t attack enemies directly, nor does she have access to crossbows, rifles, or GEP guns. Neon Struct is a pacifist game at heart, and the only way to deal with enemies is to sneak up behind them for an instant KO or avoid them altogether. If they spot you they’ll give chase, but it’s pretty easy to shake them. Reckless players will be able to clumsily tear through the game with minimal effort, but the real joy lies in doing it with finesse, quietly, without a trace. What Cleary lacks in firepower she makes up for with an array of rad sci-fi gadgets. She can scramble cameras and disable the lights in an area to create a veil of shadow. A Thief-style ‘light gem’ at the bottom of the screen shows you how visible you are to passing guards. Slide into the darkness and you become basically invisible. She also has access to stims that can cloak her for a few seconds, silence her footsteps, or give her a health boost. There are a lot of toys to play with, and it’s when you start experimenting with these tools that stealth gets really fun. Between missions you explore city hubs, in which you can spend money on stims and gadgets and pick up side missions. These areas are a relief from the tension of the story, and are filled with optional secret areas—another homage to Deus Ex. The game’s art style is simplistic, with flat textures, blocky character models, and barely any variety, but it’s strangely atmospheric. The stark brutalist architecture, glowing neon signs, and shadowy streets make for a suitably dark, oppressive setting. I admire its brave minimalism, as it places the focus squarely on the stealth, but I did occasionally wish the world-building was a little richer. The story drew me in regardless, though. It’s a tense, twisting cyber-thriller with some unexpected beats, including a bizarre drug trip sequence. And I loved the moment early on when I was given the chance to call my boss out for being a sexist. It’s impressive that, even with such spartan production values, it manages to tell a very decent story. Neon Struct’s biggest weakness is its sound design. Missions are achingly, almost distractingly quiet, except for the sound of the guards’ footsteps. There are so many at times, it can be difficult to gauge their position relative to you. In areas with lots of guards, the cacophony of their combined clattering footsteps just sounds ridiculous. But other than that, I didn’t find much to dislike about it. If you’re intrigued by the idea of a lightweight, simplified Thief or Deus Ex, and can stomach the austere visual style, this is well worth a look.